I don't know about you, but it is just about too hot to be outside working in the yard. Between the heat, the humidity and the aggressive mosquitoes, my enthusiasm is gone. Speaking of mosquitoes, we seem to have a very aggressive new variety that is plaguing us along the all the regular varieties this year. Mosquitoes carry several viral diseases, so it is important to minimize places where they can breed and also to protect yourself when outdoors during this time of year. According to Pinellas County Mosquito Control, mosquitoes only need 1/4 to 1/2 inch of standing water for eggs to hatch and larvae to survive as they mature to adults. Scout around outside your house and landscape for sources of standing water and remove it or treat it with Mosquito Granules. It only takes two to three days for mosquito eggs to hatch into larvae and then a few more days to mature into an adult. They multiply very quickly. Gutters that haven't been cleaned, dishes under flower pots, air conditioner drip areas, bird baths, ornamental bromeliads and outdoor pet dishes can all become breeding places of mosquitoes. Change the water in pet dishes and bird baths every few days. You can purchase Mosquito Granules or Mosquito Dunks (these can be crushed in a plastic bag if you can't find the granules) to help with mosquito control. Both products contain bacteria (BtI) that kills mosquito larvae and nothing else - it is very environmentally friendly. This is the same product that County Mosquito Control drops from helicopters into preserve areas. Granules can be sprinkled over bromeliads, into bird baths (the bacteria does not harm birds), and other areas where standing water cannot be avoided. It needs to be replaced monthly or if rain overflows the container or area. Ornamental ponds should be stocked with mosquito larvae eating fish. The Center of Disease Control recommends that when you are outdoors you protect your skin from mosquito bites by wearing long-sleeves and pants or mosquito repellent products containing DEET, picardin, oil of lemon eucalyptus or IR3535 (Skin so Soft, Bug Guard Plus, Expedition). The threat of virus, although minimal, is present throughout the year, and precautions should be taken during outdoor activities. According to Pinellas County Mosquito Control, no virus has been detected in the county's sentinel chickens at the time this article was written. It's June and the weather is heating up! Soon we will be battling hot summer sun, bugs, humidity, and torrential rains every afternoon. These conditions present several challenges for the gardener, but there are things you can do now to prepare your garden (and yourself) for the heat. If you use annuals in your landscape you probably know by now that many of them don't tolerate the Florida heat very well. However, there are several annual plants that take our temps in stride. They include salvia, torenia, wax begonia, coleus, and ornamental peppers. When shopping for annuals choose compact plants with healthy leaves, good color, and lots of flower buds (they don't have to be in bloom at the time of purchase). For more information about gardening with annuals in Florida: http://edis.ifas.ufl.edu/pdffiles/MG/MG31900.pdf. Since annuals are seasonal they should make up focal areas in the garden, but not too much space, as they require a lot of energy and resources for such a short life-span. Right now is also a great time to plan new perennial plantings, including trees, palms, shrubs, and groundcovers. If you have a plan at the ready you can be prepared to install once the rainy season starts- then you won't need to water as often yourself. Just remember that if you plant something before you go on vacation you should ask a friend or neighbor to care for it while you are gone. For more information on establishing new trees and shrubs: http://edis.ifas.ufl.edu/pdffiles/EP/EP11200.pdf. You can also plant some herbs that like the heat such as basil, Mexican tarragon, and rosemary. Since some herbs are annuals and some are perennials remember to group them accordingly so you won't be disturbing the perennials when replanting the annuals. Many herbs are also suited to planting in containers- but you must remember that those plants in containers will dry out faster than those in the ground and will need more irrigation attention. For more information about growing herbs in your Florida garden: http://edis.ifas.ufl.edu/pdffiles/VH/VH02000.pdf. Summer (June, July and August are great) is also a good time to solarize your vegetable garden, so you can add this to your summer gardening plan. What does that mean? Well, this one prep can help reduce soil pests and even kill weed seeds, making your garden more successful throughout the fall gardening season. Solarizing involves harnessing the heat of the sun by covering the soil with clear plastic and is most effective in the summer months. To solarize, you want to prepare your soil with any amendments such as compost or manures before you begin. Make sure your garden is clear of rocks, twigs, weeds, and other debris. Till the soil to at least 6 inches to make sure the heat will penetrate deeply enough to be effective. The day after a good rain or irrigation is best for applying the clear plastic sheeting over the soil. Lay sheets of clear plastic over the soil and bury the edges to keep it in place. Clear plastic is the only kind that will be effective- do not use black. Finally, leave plastic in place for at least 6 weeks. For more info on solarizing your garden, visit "Introduction to Soil Solarization" at: http://edis.ifas.ufl.edu/pdffiles/IN/IN85600.pdf. Last, but definitely not least, make sure to watch out for your own health in the heat. Slow down, dress for summer, do not get too much sun, drink water, do not drink alcoholic beverages, and spend more time in air-conditioned places. The University of Florida Extension has a great webpage for heat safety that everyone should read before it gets too hot: http://extension.ifas.ufl.edu/hot_topics/agriculture/heat_stress.html. 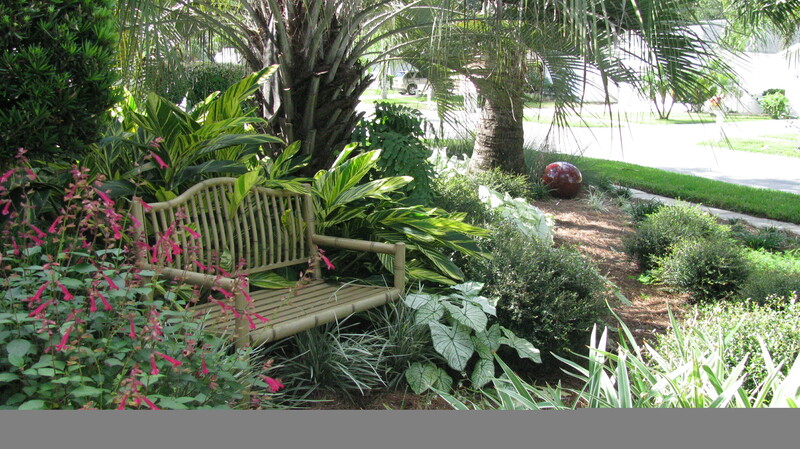 Shade is a wonderful thing in Florida gardens because of the cooling relief it brings from the hot sun. But gardening in the shade is a bit different than when full or part sun is available. Shade brings with it a set of gardening challenges. The plant pallet is different and can be very green. To get variety, you may need to vary the texture and shades of green or look for variegated foliage. Look at the shade patterns carefully before you decide on the types of plants you need. The shade of a house facing west is only temporary and the blazing evening sun comes in as the afternoon progresses, so this area should not be considered shade at all. Partial shade has at least a few hours of sunlight, light shade will have bright light but little full direct sunlight, full shade is constant throughout the day all year long. There is also the dense or problem heavy shade under dense leaved trees. This can be the most challenging. Plants that prefer full sun will grow spindly and/or bloom poorly or not at all in the shade. Grass is also a challenge to grow in the shade, so ground covers provide a better alternative. You may have more slugs and snails in shade gardens. Also, you need to provide for good air circulation, since fungal diseases can be more of a problem in the damp shade, so give individual plants plenty of breathing room. A number of plants are particularly adapted to thrive in the shade. Some understory plants for partial shade include azalea, copper leaf, camellia, European fan palm, firebush, hollies, pittosporum, and ajuga ground cover. Plants for full shade include viburnum, cast iron plant, bromeliads, cardboard palm, nearly all ferns, ivies, Asiatic jasmine, liriope, mondo grass, and podocarpus. There are some flowering shrubs that thrive in partial to full shade; oak leaf hydrangea, many clerodendrums, Florida anise, rouge plant, firebush and wild coffee. 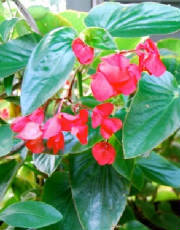 Both impatiens and begonias are great for flower color, as well as gingers, Nun's orchid, and in our winter - pansies. Just remember, impatiens are deer candy. Another way to liven up a shady area is to use plants with variegated foliage or light colors. Caladiums and coleus do not provide colorful blooms, but their leaves are very colorful during the summer months, and they both thrive in the shade. 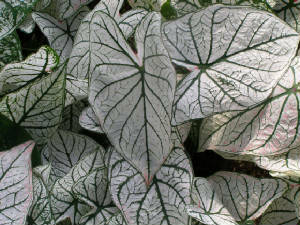 The caladium variety ‘Candidum' has mostly bright white leaves with green markings. It really shines in shady spots. Several coleus varieties have lime green foliage that also can light up the shade. And, if you like growing orchids, they can hang from the branches in the shade that trees provide. Ferns, ivy and many bromeliads are good choices for that heavy problem shade. Bromeliads are one of my favorite shade plants, but mosquitoes living in the water that bromeliads hold can be a challenge. Mosquito Granules and Mosquito Dunks are both products that contain a type of bacteria called Bt that kills mosquito larvae. Sprinkle a few granules in each bromeliad every 30 - 40 days to keep mosquitoes from breeding. If you can't find the granules, look for Mosquito Dunks where small pond supplies are sold. You can put one dunk into a plastic bag and crush it with a hammer then use this to treat your bromeliads. Gardening in the shade will be a cooler job than being out in the sun this time of year. A good reference book that includes a listing of Florida-friendly landscaping plants along with pictures and growing conditions is available free from the Southwest Florida Water Management District. 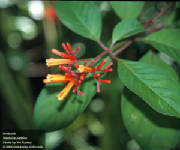 The name is "The Florida-Friendly Landscaping Guide to Plant Selection & Landscape Design" and it can be ordered online at http://watermatters.org/ or downloaded as a PDF file from the same site.